There are certain people I truly admire. Their moral principles, courage and contribution to society is purely breathtaking. As I read about their work in awe, I can’t help but feel motivated to fight for humanity, fight for justice, fight for peace, just like they do. 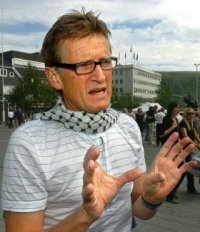 One of those people is Mads Gilbert, the Norwegian physician who arrived along with Erik Fosse to support the humanitarian effort at al-Shifa Hospital during operation cast lead, or more accurately, the Gaza massacre. This post will be a compilation of all his interviews and videos during the recent attack on Gaza. Amy Goodman: Can you explain more fully these kinds of amputations, Dr. Gilbert? Dr. Mads Gilbert: You know, often, if you have a grenade amputation or an amputation from any kind of metal fragment, it will be more like you had a hatch or an ax or a huge knife that cut through your bone and the muscle. What we see in these suspected DIME amputations is that the whole limb is crushed in a way that must suggest some sort of immense power that has hit the lower part of the body. And we know that these small bombs, which the DIME bombs are, explodes in a way so that it will mainly affect the lower limbs. The limbs are—you will have multiple very severe fractures. The muscles are sort of split from the bones, hanging loose. And you also have quite severe burns where this energy wave has hit. If you look at pictures from sites where these patients have come, you don’t see fragments in the walls in the house around, maybe fifteen, twenty meters apart from the explosions. And you see only some stripes of power in the sand on the ground, and these actually are the examples that the power dissipates very quickly, maybe within five or ten meters of the explosion, so that you will not have this kind of collateral damage, as it’s called. But in Gaza, again, so densely populated, that these DIME weapons will have a devastating effect. Also, they are, by some, classified as nuclear weapons.